A-1 Evans provides our customers with the highest quality home repair, painting, roofing, construction, and chimney cleaning and repair services. Our dedicated staff has over 30 years of professional expertise and is certified to provide you with the necessary services. 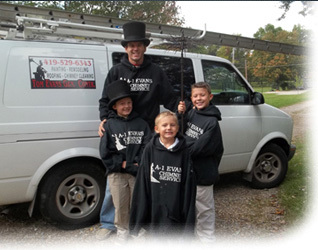 We give you the advantage of hiring professionals who know best when it comes to interior and exterior property improvements and professional chimney sweeps. Whether you want your roof replaced, a screened-in porch, or yearly maintenance for your chimney, you can count on us. We understand and appreciate the value of your property. That’s why we have made it our mission to provide you with services and products that are reliable and high quality. Even though our company’s business continues to grow, our belief in the value of an honest, one-on-one relationship remains our goal. The owner of our company, Tom Evans, is an experienced professional who expects every employee to give their best. Our staff believes in superior customer service. We always want you to think of us first, whenever you need home repairs. If you need anything related to home repair, maintenance or construction, call us. We are here to help. Just give us a call and we will take care of the rest. today, if you are interested in what we can offer you, and would like a free estimate. A member of our experienced team will be available to take your call. We look forward to serving you soon, we’d like for you to be part of our story.